Ahhhhhhh, what a nice break I had! Got lots and lots of relaxing done and although tomorrow is the start of another work week, at least it will be a normal work week. Tomorrow will also mark the start of getting back on the weight loss wagon for many of us who were thrown off during tax season! I don’t have a formal plan for this, since I don’t want to get back into my all or nothing mindset and set myself up for failure yet again. I haven’t decided yet whether I will go back to Weight Watchers or count calories instead. I think that I will focus on making healthy choices and watching my portion sizes for a couple weeks to ease into things. I think where I do need a formal plan is for exercise. I met with my trainer this past weekend and he said if I want to see progress I really need to be doing cardio 4-5 times a week and strength-training 3 days a week. That sounds like a lot to me right now considering I haven’t been doing much, but it’s something to work toward. So I’m thinking about aiming for 3 days of cardio and 2 days of strength-training for a couple weeks and then moving up from there. Once I’m set on exercise I think the eating will follow. 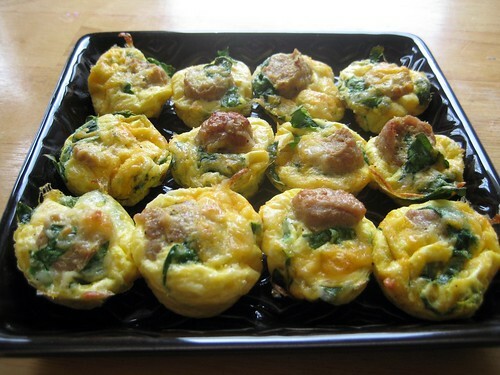 First up are some mini sausage, spinach, and cheese frittatas I made for breakfast this week. I’m sure everyone’s seen some variation of the mini egg quiches that South Beach Diet devotees swear by. This is mine, inspired by the egg muffins featured on Kalyn’s Kitchen. Preheat oven to 375 degrees. Take a silicone muffin pan and spray with cooking spray. I used a mini muffin pan that yields 12 mini muffins. Heat up breakfast links in microwave, then cut each link into fourths. Place a fourth into each muffin well. Divide spinach and cheese among the muffin wells. Add whatever seasonings you want. Pour the egg beaters into each muffin well so that each is filled up about 2/3 of the way. Bake mini frittatas for about 20 minutes or until egg is cooked through and cheese turns golden brown. This makes 12 mini frittatas – I figured 3 servings of 4 mini frittatas each. Next up is my submission for this week’s BSI contest. This week’s ingredient was lemon and I had a hard time deciding what I wanted to make. In the end I decided to tweak a tried-and-true recipe I’ve made a few times for a lemony couscous salad. I found the original source of this recipe via the WW message boards, which in turn came from this article. My first tweaking of the original was to substitute parmesan cheese for the feta cheese that was called for. For this week’s BSI I thought about tweaking it a little more in order to get . . . Combine shredded spinach with dry couscous. Add 1.25 cups boiling water, stir, and cover. Let sit for about 5 minutes, then fluff with fork. Add lemon zest and olive oil, and stir to combine. Allow couscous to rest and come to room temperature. Now add in lemon juice and Parmesan cheese. Add salt and pepper as necessary. This makes about 4 servings and tastes great cold or at room temperature. A big thank you to Mr. Spice for taking this picture! Your egg muffins look delicious! The recipe lloks delicious and seems very easy to prepare! I lvoe it! Thanks for entering it…. 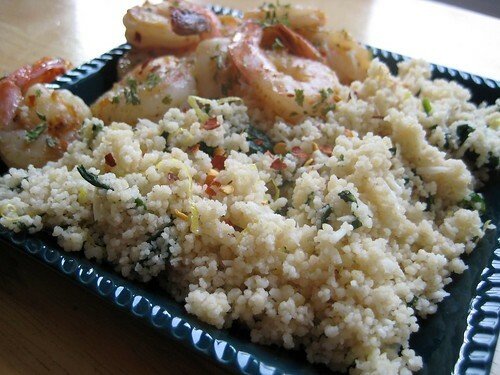 The lemony couscous looks delicious. Such a light, summery kind of dish. Now if only it would warm up here. Kalyn — thanks! After seeing them on your site I had to try them out! Krista and Gayle – Thanks, it is VERY delicious, try it! Previous post: Yay for 4-day weekends! Next post: Bring on the bentos!